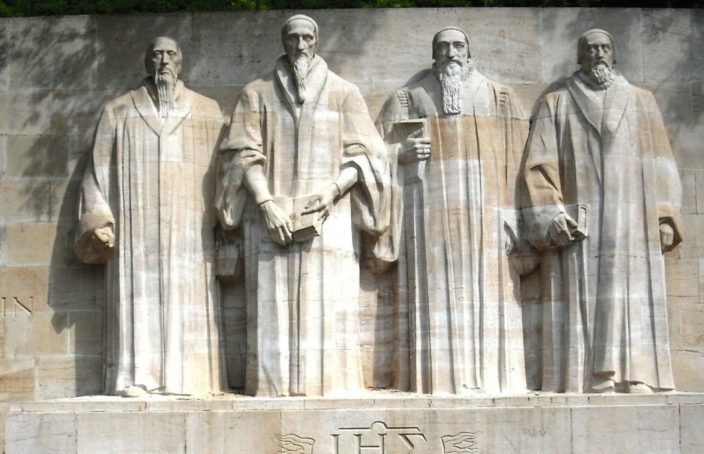 It’s an oft-repeated question: is the Reformation still necessary? On this Reformation Day, it is proper to consider how the gospel renewal impulse of yesteryear applies to our present moment in history. Central to the Reformation was the fact that God places us before his unbroken gaze. We who were once separated from Christ—strangers to the covenant or promise and without hope in the world—have been drawn into the loving embrace of Father, Son, and Holy Spirit. This happens, says the Apostle Paul, “by the blood of Christ” (Eph 2:13). But how exactly does it happen? It is at this point in which the phrase “faith alone” (sola fide) is so important to the Protestant tradition. From the earliest days of the sixteenth century, sola fide was a slogan to describe how sinners receive the gift of acceptance. On the basis of Scripture, Reformers recognized God to justify men and women apart from meritorious works. In the words of Paul, “And to the one who does not work but believes in him who justifies the ungodly, his faith is counted as righteousness” (Romans 4:5, ESV). All of this is pretty straightforward. We are accepted because of Christ, and not on account of our achievements. And yet, foundational as this doctrine may be, those of us with a modicum of self-awareness recognize our tendency toward self-justification. We succeed, we accomplish, we perceive ourselves to be significant, and this, we think, hastens our acceptance. It’s the normal pattern of life in the world. But such self-reliance is incompatible with life in Christ. The Reformers recognized in their historical moment this same challenge we see in our own: God embraces sinners and we recoil from his presence. God establishes, feeds, and fulfills his promises, and we regularly mistrust his motives. God pledges his love by providing his Spirit as an enduring bond, and we doubt his commitment. So long as this is the case, reformation will continue to be necessary. Yes, over and against advocates of Catholic renewal such as Desiderius Erasmus, Protestant Reformers refused to see Jesus as an ethical paradigm for Christianity. They insisted, first and foremost, upon spiritual union with the crucified and risen Christ as the priority and guiding impulse of faith. “Did we in our own strength confide,” wrote Luther, “our striving would be losing.” Thus, the “theologian of the Cross” lives by this conviction, and it animates the cruciform shape of his or her life. In short, we come to the Savior full of weakness and find his grace to be sufficient. But how do we find God’s empowering grace to be sufficient? This question leads us into ethics. Contrary to popular opinion, it is not by relegating the Christian life to forgiveness—a merely judicial or forensic faith. In Oswald Bayer’s words, “The new human is no grotesque caricature who spends his life in a darkened room, reciting with closed eyes, ‘I am justified by faith alone, I am justified by faith alone.’” While Reformation Protestants assert that we are justified by faith alone, this faith does not remain alone: “For we dream neither of a faith devoid of good works nor of a justification that stands without them,” said the Genevan Reformer. Such virtue is not extra-credit for religious overachievers; it is the natural unfolding of our life and calling as children of God. We may not agree with our Catholic friends in recognizing divine acceptance as a sacramental process that consists in moral virtues and good works, but we nevertheless insist that authentic faith issues forth in good works. “Work out your own salvation with fear and trembling,” said Paul, “for it is God who works in you, both to will and to work for his good pleasure” (Phil 2:12-13, ESV). Salvation may not be achieved “by” works, but it is certainly comprised “of” works. This article first appeared in Light Magazine (vol. 3, issue 1), a publication of The Ethics & Religious Liberty Commission of the Southern Baptist Convention. Oswald Bayer, Living by Faith: Justification and Sanctification. Trans. Geoffrey W. Bromiley. (Grand Rapids: Eerdmans, 2003), 27. John Calvin. Institutes of the Christian Religion, (3.16.1). Martin Luther. What Luther Says, An Anthology, vol. 3, ed. Ewald M. Plass. St. Louis: (Concordia Publishing House, 1959), 1510.